I started off with a game of Evo with Bill Murdoch (an old friend originally from the Spielbany playtests) and a couple other people. I was new to the game but managed to come in second place, losing by only two points. I ended the day with a 5-player game of Navegador and placed second in that as well. In between, I managed to spend some time talking shop with Steve Buonocore and Zev, who also frequent the Jersey conventions. 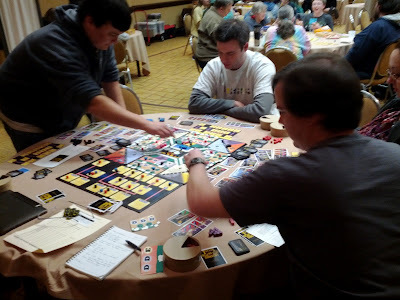 But before all that was a playtest for Titans of Industry. There were four people signed up for the game. Two of them failed to show up, but two alternates took their place. 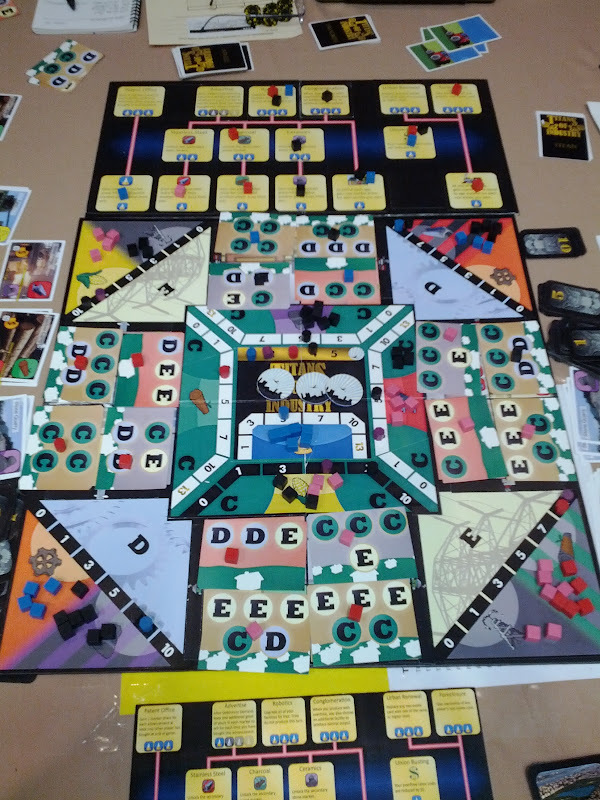 In fact, three of the four players had played in the Municipality playtest the previous day. This included the person who hated Municipality, so I braced myself for some harsh criticism against Titans. The game went smoothly. I was happy to see many advancements being purchased again. I have full confidence that I now have the right mix. The only weird thing was they managed to buy 12 real estate by the end of the second age. That normally doesn't happen until near the end of the third age. As a result, they managed to be the first group ever to trigger the end game using the alternate rule: if all 16 real estate spaces are build, the game ends immediately. I was astonished that they managed to do this, but I was happy to see that it did not adversely affect the game. The final scoring still played out relatively normally. Every single player gave unqualified positive feedback, including the tough critic of the table. One later told me that, out of the four new games he had learned at the convention, Titans of Industry was his favorite. This is it. The game is done. I know I've said that before, but now I can feel it in my bones. This is going to be a great game for fans of economic games. Or not. There's one tiny hiccup that has nothing to do with the gameplay. I hinted at it in a post a couple of weeks ago. I haven't figured out how to resolve this problem yet. Over the next week I'll mull my options and post my decision here.